StreetPrint is the most innovative decorative paving system developed in the last 30 years. It gives customers the beauty of hand-placed decorative products, but also adds the benefits of a continuous surface, which inhibits both weed growth and shifting problems associated with freeze/thaw cycles and vehicle movements. Available in many different patterns and colors you can customize your project to be unique. 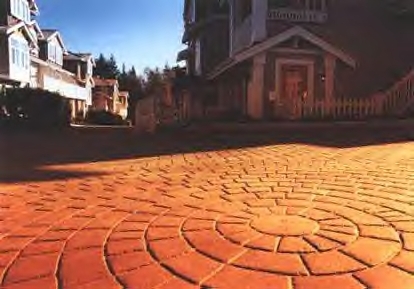 The patterns range from off-set brick to frisco cobble. Even if you don't want to use a pattern on your whole project you can choose from many different accent pieces. From a half circle to a full circle in the middle of your driveway or just add your street number to the bottom of your driveway, your project will make your house stand out in the neighborhood. There are ten colors to choose from ranging from brick to granite. The coloring system is specially designed to last on pavement. The coloring system used is oil, water, and gas proof. Custom colors are available at an additional cost.